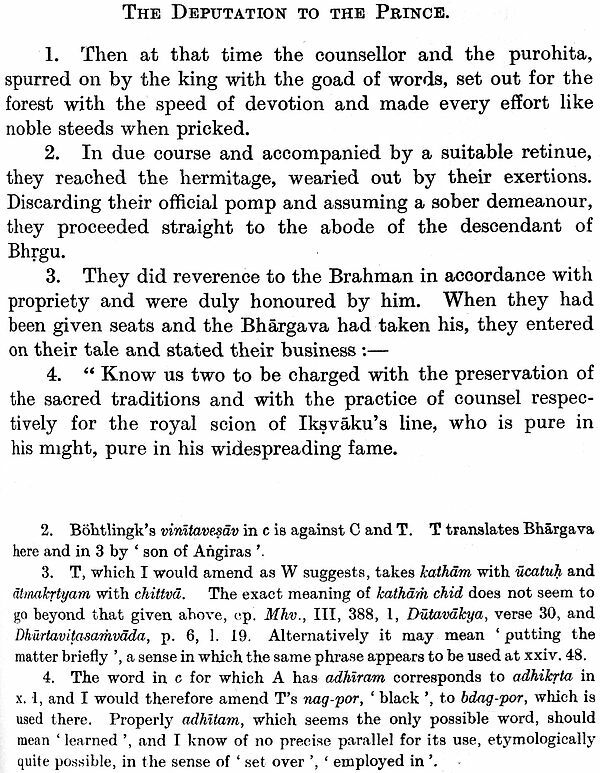 The Budhacarita is a well-planned work written in Sanskrit by Asvaghosa who was a contemporary of Kusana emperor Kaniska. It is one of the few biographies of Buddha that is complete commencing with his birth and ending with his nirvana. This work is composed in the style of ornate court poetry or Kaavya. Unlike the Mahavastu and the Lalitavistara, it is a systematic treatment of the subject matter. The poet is not only moderate in language and style, but he also uses restraint in the presentation of miracles in the Buddha ledend, keeping himself far removed from exaggeration. Unfortunately only half of the work, i.e. 14 or 28 cantos survive in its original Sanskrit, providing us the story upto the Maravijaya; Tibetan and Chinese translations consist of the entire cantos. The present edition contains the Sanskrit text of cantos I-XIV; translation of cantos I-XIV; and, the translation of remaining cantos XV-XXVIII based on available Tibetan and Chinese versions. Edward Hamilton Johnston (26 March 1885- 24 October 1942) was a British oriental scholar who was Boden Professor of Sanskrit at the University of Oxford from 1937 until his death. Edward Hamilton Johnston was born on 26 March 1885. He was educated at Eton College before studying at New College, Oxford. He joined the Indian Civil Service, winning the Boden Sanskrit Scholarship during his probation, and worked in India from 1909 onwards in various capacities. 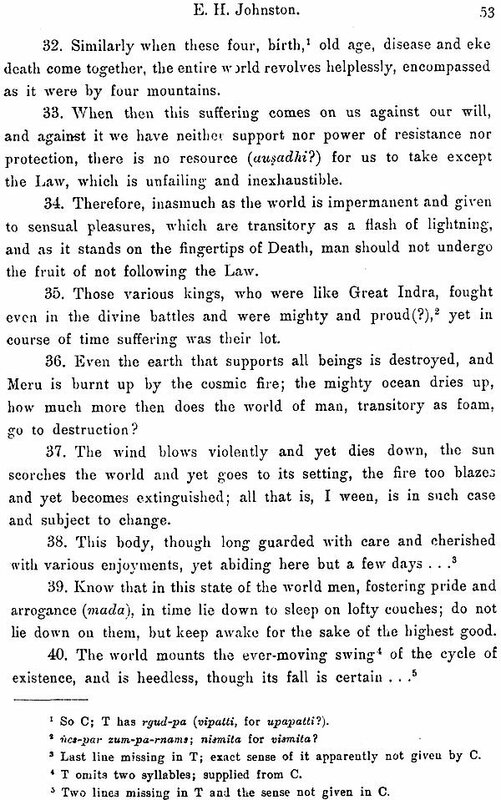 Although Johnston seems only to have published one article in India (on a group of medieval statues), his later works show that he had noted local Indian practices in agriculture and other areas, since he made reference to these in his analysis of Sanskrit texts. 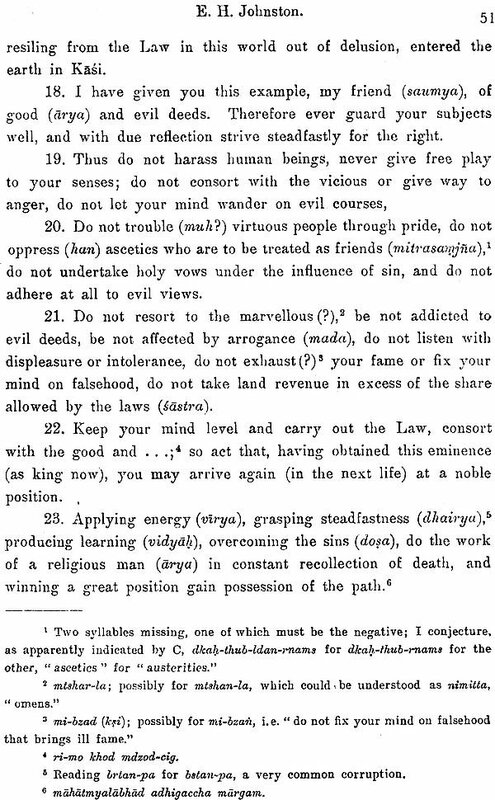 Between 1928 and 1936, he published an edition and translation of the Buddhacarita ("Acts of the Buddha") by the second-century author, Asvaghosa; this was described in The Times as his "magnum opus". In 1937, he was elected Boden Professor of Sanskrit and Keeper of the Indian Institute at the University of Oxford, also becoming a Professorial Fellow of Balliol College. He died on 24 October 1942 at the age of 57. Over forty years have passed since the late Professor E. B. Cowell brought out the editio princeps of Aavaghosa's Buddhacarita, followed by a translation in volume XLVI of the Sacred Books of the East. 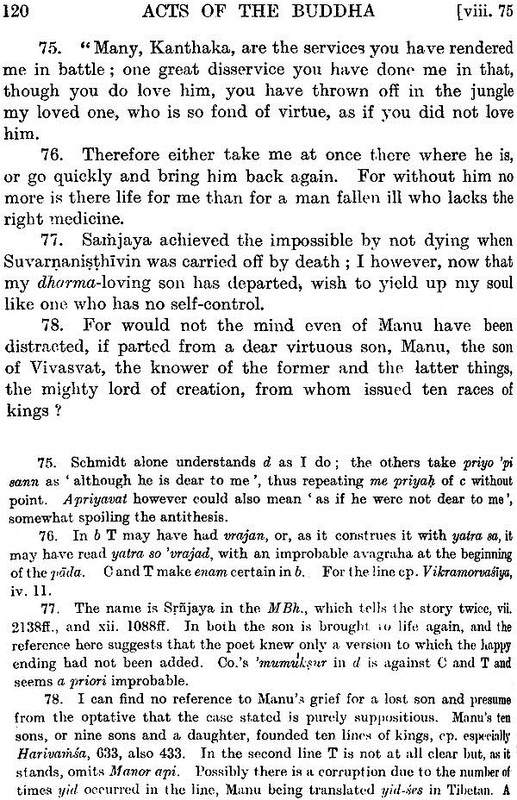 Though scholars in Europe were quick to accord it a high place among Sanskrit kavya works and to appreciate the excellence of the editing, they did not fail to see that the materials from which the text was prepared were extremely faulty, and that much correction would be required to bring the poem approximately to the state in which it left its author's hands. Accordingly at the suggestion of the veteran von Bohtlingk, who himself led the way with a list of amendments, many of which undoubtedly hit the mark, a number of scholars set to work on improving the text by conjecture. The process has continued to the present time, but, though the alterations put forward were in general distinguished by knowledge and acumen, there is no such thing as a certain conjecture, and, if in the easier passages the right alternative was often found, no measure of agreement was possible in the more substantial difficulties. A new edition, talked of more than once, has however never appeared, presumably because a text, whose differences from that of Professor Cowell would be merely subjective, must necessarily be of too speculative a character to have real value. Of recent years the position has changed. Early in the century a MS., much older than those used for the first edition but covering only the same portion of the text, was acquired by the Nepal Durbar and described by MM. H. P. Sastri in JASB, 1909, 47. 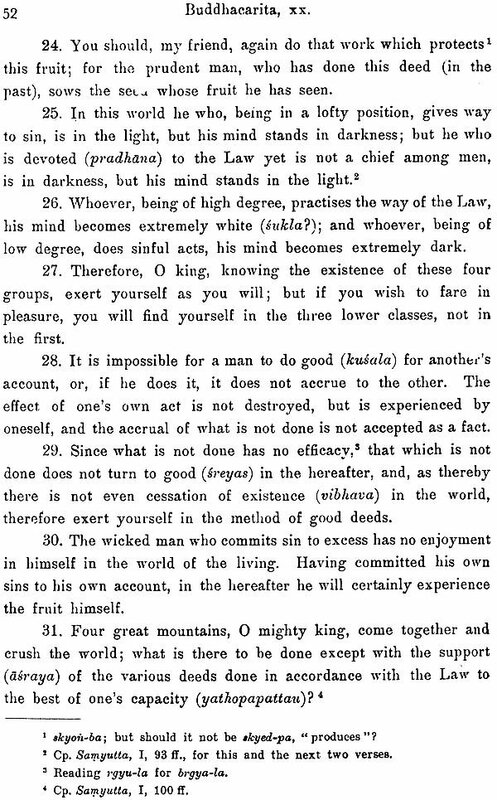 Since the beginning of the century the use of Tibetan translations for the correction of faulty Sanskrit originals has also come to be much better under- stood, and lately the translation of the Buddhacarita has been made accessible to students in an edition by Dr. Friedrich Weller, constant use of which has convinced me of the high standard of excellence it attains. Further the Chinese translations have now been made easier to consult for those who are not Chinese scholars by the appearance of the Taisho Issaikyo edition. 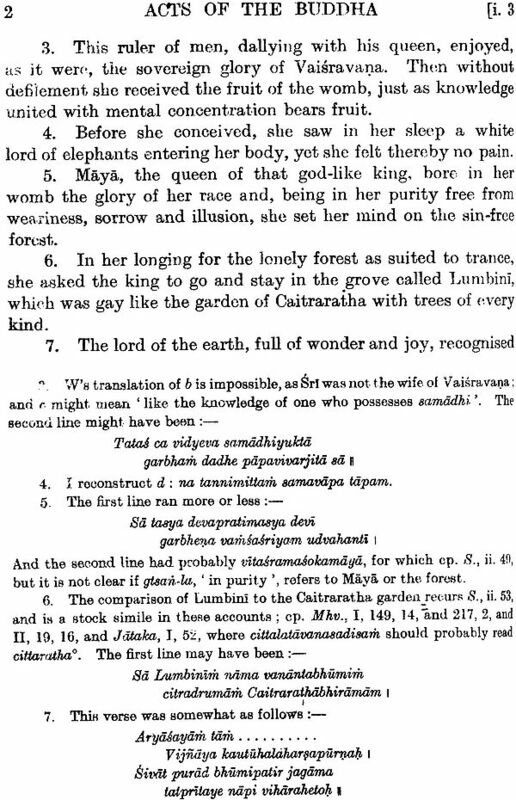 And finally the publication of many Buddhist texts and of Sanskrit works, not far removed in date from Asvaghosa, not to speak of a long and important work by the poet himself, the Saundarananda, has provided us with further means for the critioal examination of his language and ideas. The availability of so much fresh material makes a new edition both possible and highly desirable, but its very mass has as a consequence that much time and labour must be devoted to its collection and sifting, so that it is now more than ten years since, at the suggestion of the late Professor A. A. Macdonell, the present editor set his hand to the task. While well aware of the many respects in which my attainments fall short of those of the ideal editor of the Buddhacarita, I have endeavoured to cover the ground, both by reading with one eye on Asvaghosa's works everything published in Sanskrit or Pali that might throw any light on obscure passages and by acquiring that smattering of Tibetan and Chinese which is requisite for comparing the translations in those languages with the Sanskrit original. The fruit of this labour I now present to Orientalists, with the earnest hope that they may find, not finality it is true, but at least a substantial advance in the restitution and interpretation of the extant fragments of a famous poem. This edition consists of two volumes; the first contains the Sanskrit text and the apparatus criticus, and the second the translation of the first fourteen cantos, filling up the lacunae in the Sanskrit from the Tibetan, together with an introduction dealing with various aspects of the poet's works, with notes which discuss the many difficulties of text and translation, and with an index. The arrangement is such that with the two volumes open before him at the same point the reader can see at a glance what help I can give him. The chief authority for the text is the old MS. in the Kathmandu Library, which I call A. It was sent over to England by the Nepal Durbar in 1924 at the request of the late Professor Macdonell to be rotographed and the reproduction, unfortunately far from perfect, belongs to the Trustees of the Max Muller Fund and is described in Mr. Gambier Parry's catalogue of the collection. The MS. consisted originally of 55 palm leaves, of which numbers one, three, seven, and eight are no longer in existence, covering verses i, 1 to 8b, i, 24d to 40c, and ii, 1 to 35. It ends abruptly in the middle of the second line of leaf 55b at verse xiv, 31, of this edition, and has no colophon, repeating simply the last line of the last, verse in a late Newari hand. The handwriting is an early form of Bengali, having the Bengali pa and tending to write ga and. sa in accordance with that, alphabet. To judge from the dated MSS. in the' Cambridge University Library, particularly Addl. MSS. no. 1699 of 1199 A.D. and ] M4 of 1446 A. D., the margin of error should not exceed 50 years on one side or the other, if the date of 1300 A.D. is assigned to it. While the handwriting is good, mistakes abound and a number of passages are so rubbed as to be barely legible. Palaeographically it is important to note that ba and va are written alike, though distinguished by me for clearness' sake in the variants, and that as the second members of compound characters these two letters are indistinguishable from dha, that ca and va are often so much alike that the reading can only be settled by examining the pen strokesunder a magnifying glass (the loop of ea is written 'with two strokes, of va with one), that ra often resembles ca and va, that rnna and lla are practically identical in shape, that rtha, vva and cca are liable to confusion, and that ta and bha, tu and tta, sa and ma, pa and ya, su and sva, are hard to separate. Occasionally sa and. ya. are much alike. In countless places I suspected anusvara of having been added by a later hand;' and avagraha is inserted 20) times in all, at times marking not an elision but the fusion of a and a. The collation of the MS. therefore demanded unusual care to determine with precision the intention of the copyist. In accordance with the intention expressed in the preface to the first part I give here an explanation of the contents of this part. The translation covers the whole of the first fourteen cantos, supplying the lacunae of the Sanskrit text from the Tibetan translation, for whose correct interpretation I rely on the Chinese paraphrase. 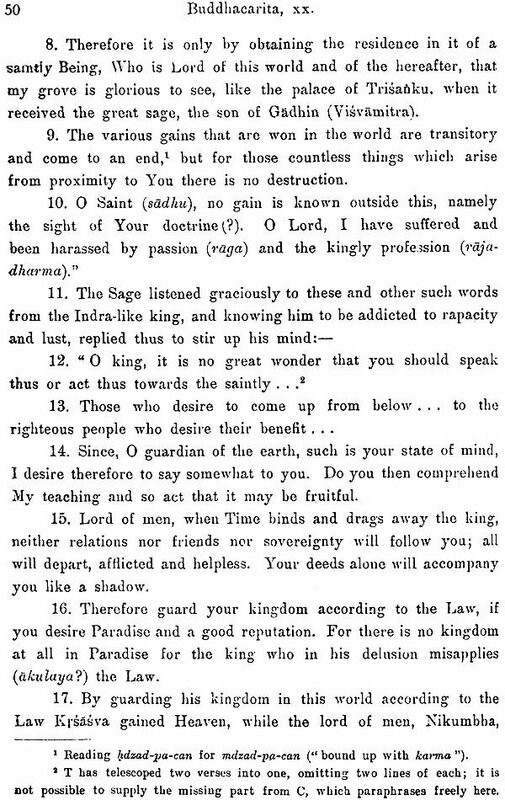 For the understanding of these passages missing in the Sanskrit I am heavily indebted to Dr. Weller’s pioneer version and trust that in the few points where I differ him my rendering is an improvement, not a darkening of counsel. The result probably reproduces Asvaghosa’s meaning with a fair degree of accuracy, but would undoubtedly require modification in detail if the original were to come to light. My translation is a pedestrian affair, designed to be read with the text and to explain its meaning, not to transmute its spirit and literary quality into an alien tongue. Nor does it follow any rigid principles; where the constitution of the text or its exact significance are open to doubt, I have preferred a literal rendering, but allow myself a freer hand where the going is firmer. Despite innumerable divergencies in detail, the greatness of the debt I owe to the late Professor Cowell’s translation, which still holds its own, will be apparent to anyone who cares to make the comparison. Of the other translations I have derived most help from that Formichi; though an occasional tendency to let ingenuity degenerate into fantasy has led to its being judged at times with unmerited harshness, its criticism of earlier attempts to elucidate difficulties are usually acute and deserving of careful examination. Of the two German translations, Cappeller’s is too free to be of much help in the task I set myself, and Schmidt’s, though scholarly suffers from inadequate study of the material. The four Indian editions of the first five cantos have provided me with useful hints in places, especially in those points which often escape the eyes of Eurpean scholars. In the notes I endeavour to mention all substantial difficulties of text and interpretation; for though regard for the expense involved in the printing of full discussions have often deterred me from dealing at the length I should have liked with many matters and have caused me to dispose summarily of the opinions of other scholars which were worthy of better treatment, it seemed to me that the best service I could render to future workers on the poem was by careful selection to focus attention on those points which really call for serious consideration. A number of references to parallel passages, drawn from all departments of Sanskrit and Pali literature, are given, partly because it is only by careful study of them that Asvaghosa’s exact place in the history of religion and literature can be determined, and partly because the translator must not only make sense of his text, but also give a sense which conforms with Indian ideas of the first century A.D.; particular care has been devoted to choosing for mention only those passages which are genuinely relevant. The index includes, besides names, all those words whose discussion in the notes might conceivably be of use to others. Under the abbreviations I have gathered together all the modern literature known to me which makes the Buddhacarita its main subject. Finally the introduction makes the first attempt to present a complete picture of Asvaghosa based on all the sourees open to us. As first attempt its deficiencies are as patent to me as they will be to everyone else, and difficulties of finance have led me in many cases to allot only a few words or lines to problems which would have required many pages for comprehensive discussion. 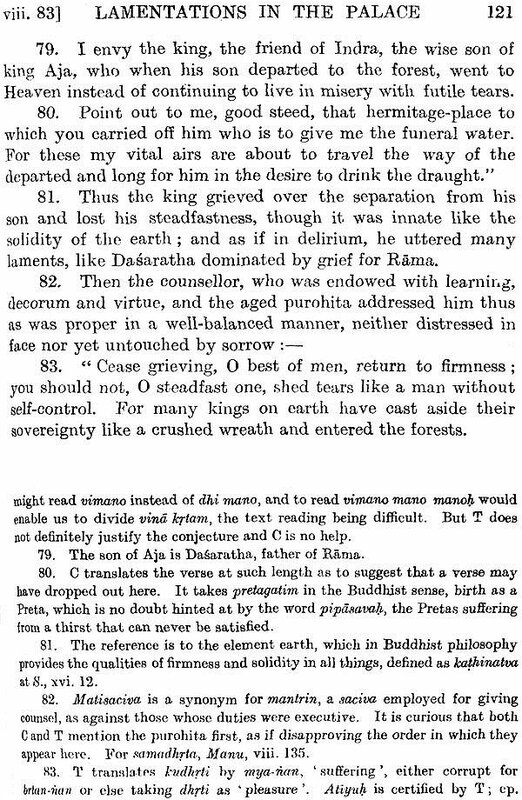 On the question of the poet’s handling of legend my treatment is utterly inadequate; on most traditional details of the Buddha’s life it will remain impossible to make confident assertions, till the Chinese sources are made available to us on the lines which Professor Przyluski has adopted for the First Council and for the Asoka legend. The thread is formed by two main ideas, neither of which has so far been fully accepted. Firstly, I can attribute but small value to the traditions preserved in Chinese literature about the poet’s life. And secondly, I look on him as a very learned and conscientious man, who was perfectly aware of what he was doing and who never knowingly made a wrong or fantastic statement about religion, philosophy or legend. 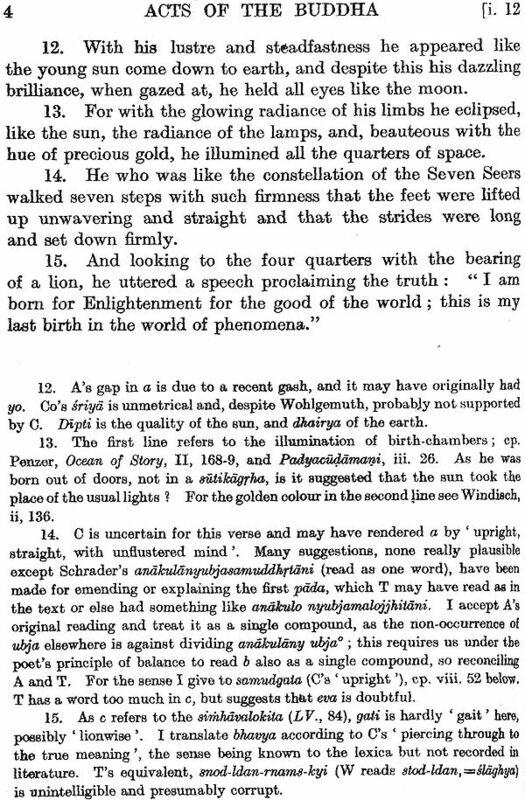 If we cannot always explain his sayings, we should ascribe this rather to our own ignorance of the literature with he was familiar, and it is absurd to expect from him either the attitude of modern higher criticism or a historical knowledge of events in the sixth and fifth centuries B.C., which is not to be found even in the oldest parts of the Pali canon. Let it at least be counted to me for merit, if despite many shortcomings I have been able by years of work to bring into clearer relief one of the greatest figures of Indian civilisation. One phenomenon recurs again and again in the history of Sanskrit literature, namely that we know nothing certain of the lives of its greatest figures beyond what they themselves choose to tell us and what is stated in the colophons of their works. Asvaghosa is no exception to the rule. While he is silent about himself, the colophons of the three works which we know to be his agree in describing him Saketaka, a native of Saketa, and as the son of Suvarnaksi. Before discussing the bearing of these facts, it is best to determine his date with such accuracy as is possible. 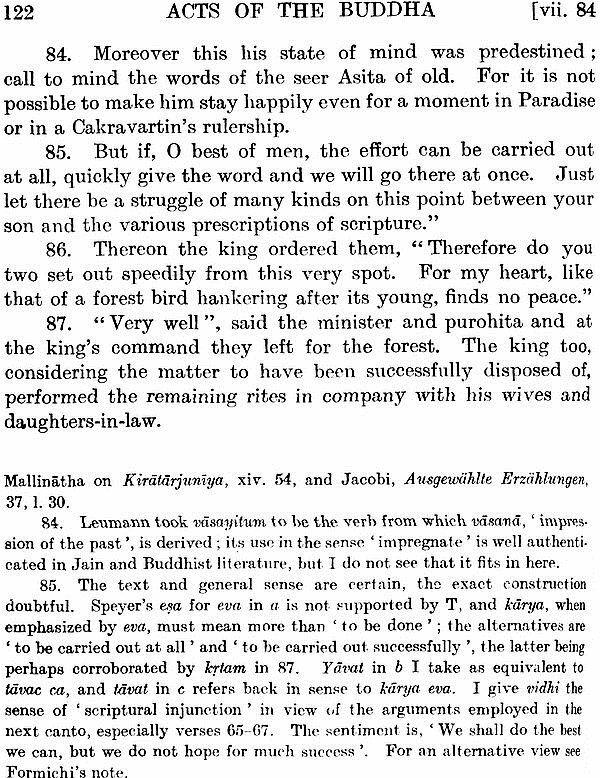 The lower limit given the Chinese translation of the Buddhacarita made early in the fifth century A.D. can be set back by three hundred years; for Professor Luders holds that handwriting of the MS. Fragments which contain all that is left to us of the Sariputra-prakarana must belong to the times of the Kushan kings, probably to the reign of Kaniska or Huviska. Dating by palaeography does not always give as assured results as is sometimes supposed, but the margin of error in the present case cannot be large; for the MS. Was corrected by a Central Asian hand, which equally on palaeographical grounds may be as early as the end of the Kushan era, and it shows signs of having been long in use before the overwriting took place, so that to impugn the first date means impugning the second one also and it is hardly that both should be misleading. The connexion between the two is obvious, and the expression, vyavasayadvitiya, between the two is obvious, and the expression, vyavasayadvitiya is apt in Asvaghosa, because the Buddha has just been deserted by the five bhiksus and has nothing but his resolution to accompany him on the maroh to the bodhi tree; but Matrceta’s version spoils the point, because a Buddha can have no companions in the process of obtaining Enlightenment. This view is enforced by B., xiv. 99, where Indra and Brahma more appropriately find the Buddha with the dgarma he had seen as his best companion. Is it not clear then Matrceta has borrowed a phrase from Asvaghosa and turned it into a cliché? 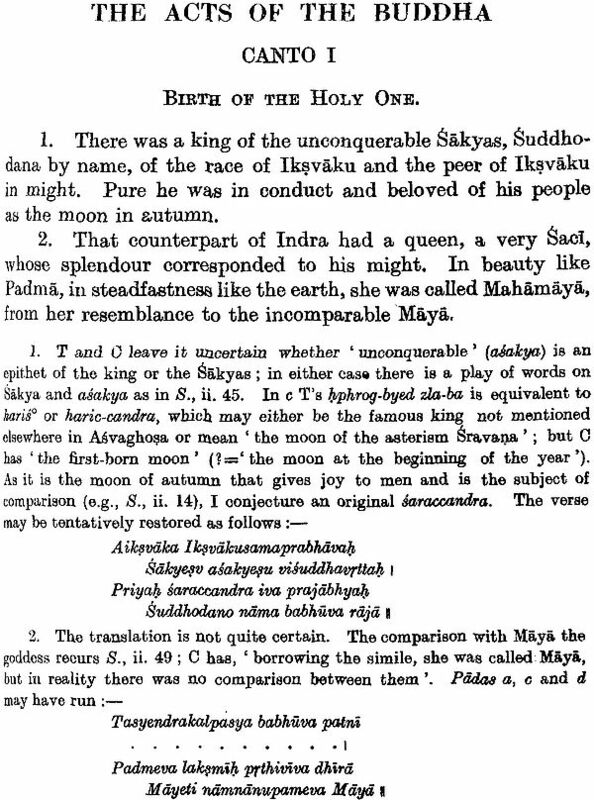 That the former is somewhat later in date seems to follow also the style of the Satapancasatka; thus note the fanciful verbs, jaladaya, Vainateyaya, madhyamdinaya, Sakrayudhaya, of verses 74 and 75, which suggest some advance on Asvaghosa in verbal tricks. He is morcover the author of an epistle to Kaniska, and if we accept the latter’s name as authentic, it would follow that Matrceta lived in his reign and Asvaghosa before it. I would not press this piece of evidence, but so far as it goes, it suggests that Luders dating of the MS. Of the dramas is at any rate not at odds with the probabilities.